The 2018 Learn Serve Lead Meeting of the Association of American Medical Colleges (AAMC) brought together more than 4,000 attendees in Austin, Texas, for inspired learning on the hot topics in medical education and the world today, including humanism, inclusion, and experiential learning. The conference ran from Friday, Nov. 2, to Tuesday, Nov. 6, 2018, with motivating plenary sessions, powerful talks, practical tips for improving medical education, and much networking that strengthened ties, new and old, within this community of educators, administrators, and students. One of the highlights this year was the Jordan J. Cohen Humanism in Medicine Lecture, given by Dr. George Thibault, a Gold Trustee and immediate past president of the Josiah Macy Jr. Foundation. In the lecture, held on Saturday, Nov. 3, Dr. Thibault looked frankly at the state of humanism broadly. “It will be very difficult to have humanism in medicine if we do not have humanism in our world,” he said. The annual Humanism in Medicine Lecture is always a dynamic talk that brings forth new, deeply motivating insights. Dr. Thibault brought the room to tears in his call for awareness of the steady erosion of humanism. He began by tracing the history of humanism, from the Renaissance to the present day, and shared his grave concern about the lack of humanism he sees in our wider world. He urged his colleagues to face this threat to humanism. “We as a profession, as professionals, and as members of our society have even a larger challenge that goes well beyond this continuing mandate to humanize medicine. It is not just medicine that is threatened by being dehumanized. Our society at large is turning against the principles of humanism that have been its underpinnings since its founding,” Dr. Thibault said. From left, fourth-year student Hanna Distel, Dr. Mark Garry, and third-year student Jeremy Kudrna. Hanna and Jeremy nominated Dr. Garry, who is a professor at University of South Dakota Sanford School of Medicine, for the 2018 Arnold P. Gold Humanism in Medicine Award. He received a standing ovation, which was followed by an emotional sharing of gratitude during the question and comment period. 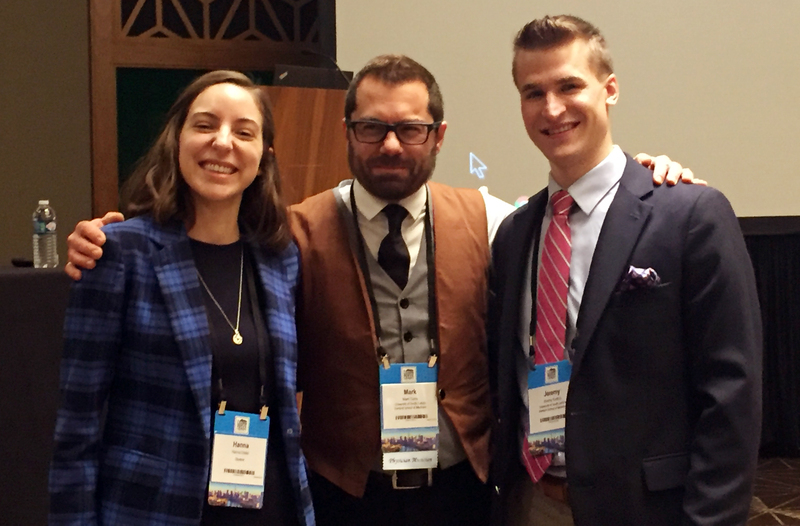 The Humanism in Medicine Lecture was one of three Gold sessions at the 2018 AAMC Annual Meeting. 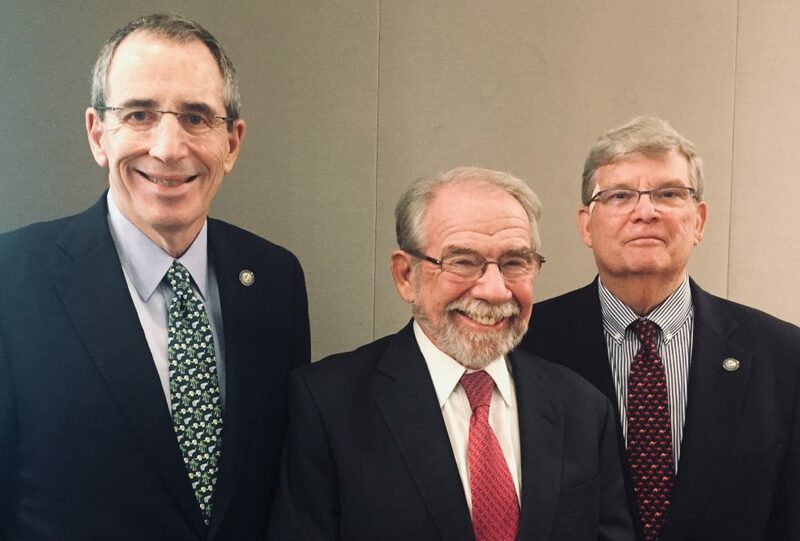 Three leaders of the Gold Foundation working to elevate the human connection in healthcare: from left, Board Chairman Richard Sheerr, Gold Trustee Dr. George Thibault, who gave the 2018 Jordan J. Cohen Humanism in Medicine Lecture, and Gold President and CEO Dr. Richard I. Levin. On Friday, Nov. 2, the Organization of Student Representatives (OSR) Arnold P. Gold Humanism in Medicine Luncheon & Ceremony honored Dr. Mark T. Garry, Assistant Professor of Psychiatry at the University of South Dakota Sanford School of Medicine, for his remarkable ability to connect with students and patients and his deeply humanistic practice. Read an article about Dr. Garry’s inspiring luncheon presentation. And a session on the Gold Humanism Honor Society: Encouraging Leadership Through Compassion, Advocacy, Scholarship, and Teamwork on Sunday, Nov. 4, showcased examples of how GHHS chapters elevate humanism in their schools and care settings. GHHS Director Dr. Dorothy Levine and Assistant Director Louisa Tvito detailed four realms of opportunities for GHHS chapters: National Projects, such as Solidarity Week and Thank a Resident Day, National Conferences, Regional Conferences, and Chapter Projects. Dean John Linton of West Virginia University School of Medicine and Vice Dean Charles Pohl of Sidney Kimmel Medical College at Thomas Jefferson University explained the impact GHHS has made at their respective schools, and Gold Foundation Co-founder and Trustee Sandra Gold added her own inspirational words. 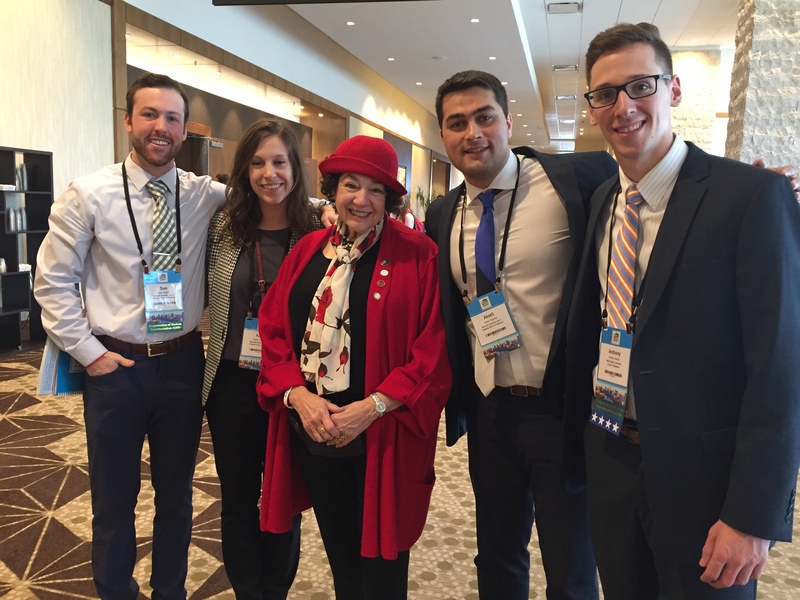 Our co-founder Sandra Gold gathers with four medical students at the AAMC Annual Meeting in Austin, Texas, ahead of the OSR (Organization of Student Representatives) Gold Foundation Humanism in Medicine Award Luncheon on Nov. 2, 2018. From left, Sam Kaplan, Kayla Rodriguez, Akash Sharma from Marshall University, and Anthony Machi from West Virginia University. And each year, the AAMC President and Board Chair offer their thoughts at a plenary session. Dr. M. Roy Wilson, Chair of the AAMC Board of Directors and President of Wayne State University, spoke movingly about his background and the importance of diversity in medical education. 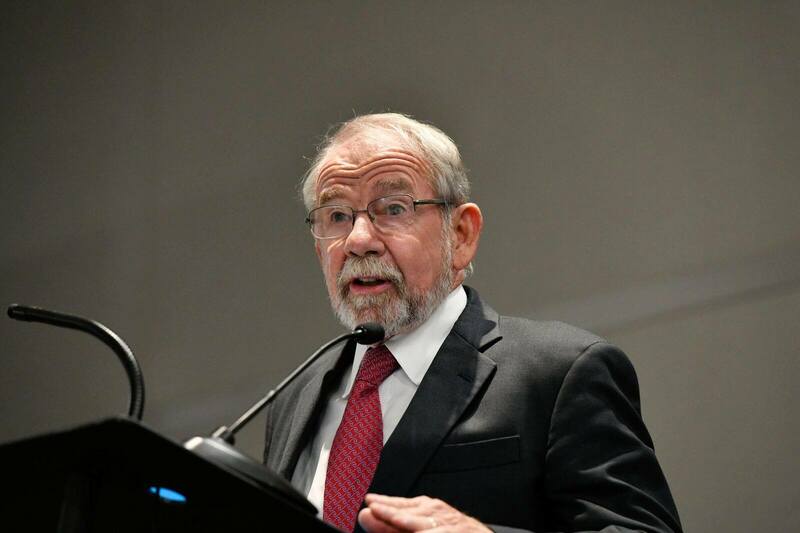 “As we are reminded every year in the presentation of the Arnold P. Gold Foundation Humanism in Medicine Award here at Learn Serve Lead, medicine is an intrinsically humanistic construct and has been from its very beginning,” said Dr. Wilson. He described the Triple Aim framework, first put forth by The Institute for Healthcare Improvement, that described the simulaltaneous and intertwined goals of 1) better health 2) better patient experience and 3) lower cost. Read the full transcript of Dr. Wilson’s speech. In the “President’s Farewell Address: Mountaintops,” Dr. Darrell Kirch gave his final speech at the annual meeting as President and CEO, as he will step down next year. Read the full transcript of Dr. Kirch’s speech. Sunday evening featured the annual AAMC awards ceremony, in which Dr. Garry received the Arnold P. Gold Humanism in Medicine Award. Dr. Richard Cruess and Dr. Sylvia Cruess were honored with the 2018 Abraham Flexner Award for Distinguished Service to Medical Education. Dr. Richard Cruess is the Chairman of the Board for the Gold Foundation for Humanistic Healthcare, Canada. Drs. Cruess made an immense contribution to establishing and recognizing professional identity as an important part of medicine. Because of their ground-breaking work over three decades, professionalism is incorporated into medical curriculum and discussed and studied widely today. 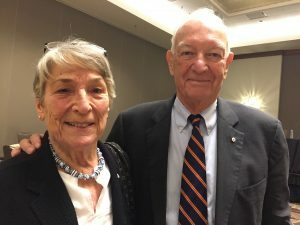 Dr. Sylvia Cruess and Dr. Richard Cruess were honored for their immense contribution to professionalism with the 2018 Abraham Flexner Award for Distinguished Service to Medical Education. “We are thrilled to celebrate the work of Dr. Sylvia and Dr. Richard Cruess this year. Their investigation into professionalism created an entirely new conversation and orientation for medical education. They recognized that technical competence was not enough – that true healthcare could not contain certain behaviors, and that it must be compassionate and collaborative,” said Dr. Levin. Learn more about the work of Drs. Cruess.